So, a star in the heavens slips beneath the horizon. The News of the Screws is no more. A pillar of certainty and tradition crumbles and I must confess to a genuine sadness. And I suspect that around the UK it is a shared sadness far more profound that a lot of the puffed up (Oh just look how moral I am) band wagoneering. I am a romantic novelist and I have been a thoroughly wicked woman. At least I know something juicy to write about. They would never have had to spy on me. I would just love to have told them! The decision to close a “toxic” brand is probably correct ……but if you think they won’t be back I wouldn’t get down to the bookies just yet. Poor Rosina had to get to the Newsagents in England at 6am this morning in order to get my final souvenir copy. She’s a bit posh and probably felt a bit sullied by asking for it. I love her though – she’s a star yah. So, this morning after my portion of baguette I ventured to the tabac for a copy of the French Sunday paper “Le Journal de Dimanche”. The lead story was about a socialist politician. The headline translated roughly as “XXXXXXX – faces rumours about her private life” Wow – did you feel the heat and explosion? Many column inches talked seriously about the Dominic Strauss-Kahn case in New York. Now, this is a sensational story with ambitious prosecutors facing utter humiliation as they come under fire for a botched case driven by what I call “big case boogie”. Meanwhile a French accusatrice alleges a sexual attack some eight years ago. The headline blares out “We have material facts says lawyer” Wow! The problem is that while in the UK they have both the gutter and the cerebral press, few countries have such a fantastic mix. Come on Ozzie tycoons- buy your way into France and give us some Dent de Lion and Murdoch. All of a sudden copies of my short story “Sub Prime” are ripping up the download statistics (Well, my statistics). We did a free audio download with it on Smashwords.com. If anyone out there reading this knows what’s going on please please let me know. A day of horrible crashes and heroism in the Tour de France. 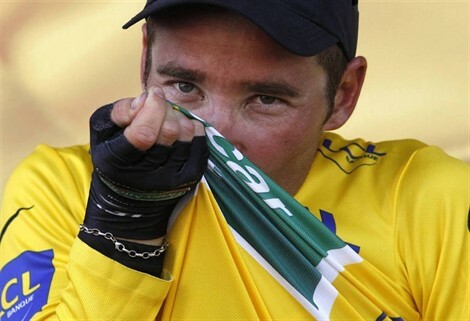 But a Frenchman Tommy Voeckler has won the yellow jersey as leader of the Tour de France. Mon Dieu merci! Emma thinx: Your life is the bus ride – not some maybe stop round the bend. This entry was posted in Cycling, Emma Calin, France, Romance Writing, Social Comment by emmacalin. Bookmark the permalink.